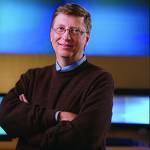 Last night Bill Gates shared his vision of the future to kickoff the Consumer Electronics Show – and focus attention during the annual gadget-fest on the role of Microsoft’s Vista in how consumers will be using electronics and technology in the coming year. Not surprisingly, his focus was on "connected experiences" and how the vision behind Vista is not just a sexed up user interface for your PC, but also the promise of connecting all your digital devices, and more importantly, sharing content between them. When Bill Gates makes a prediction, it’s worth paying attention to – and his prediction here is that users will continue to demand inter-connectedness from their devices. Yet if users are in control of content, they need to be able to share it more easily. On The Simpsons last night, Homer made a joke about not being able to figure out how to load a video onto Marge’s iPod. It’s a problem more and more consumers are facing (even the smart ones!) – and not just around the iPod. Giving them control means allowing them to use, share and even modify the content they are consuming with ease. Of course, as a marketer, my mind first turns to what this age of control that Microsoft and others are dedicated to ushering in will mean for the art of marketing. I was tempted to create list here, but I think the solution is not necessarily a top ten list, but rather a single principle: marketing with content worth consuming – and letting consumers share it easily. The age of control is placing a new emphasis on content marketing … that is, the idea that you need to create (or let your users create) more than just a marketing message. This is the formula behind BMW Films. It means focusing on the content, and also giving people the right incentives and tools to pass the message along. Blurring the lines of interactive, broadcast and word of mouth – ultimately the goal is to generate a branded message that has a value and helping people to pass it along. The value can come from many things, whether it is useful, entertaining, humorous, or just plain wierd. The marketers that understand the value of creating quality content are the ones that will stand out. The others will be ignored. So in this age of control, before you launch your marketing efforts – ask yourself if you are creating content worth interacting with. If the answer is no, chances are your customers are already filtering you out.